What can you expect from me on Twitter? I start by posing questions, every day. Some will be silly. Most will be about science fiction, science, or technology. Hopefully they will all inspire some thought, and perhaps a conversation. A good question, crafted from a place of curiosity, can cut through the noise and lead to the signal. Let’s learn to ask better ones. Follow me @NessoAsks. December 17, 2018 Posted by markegilbert | Nesso	| Comments Off on What am I doing on Twitter? I’ve written on my personal blog about a project I started called "Nesso" (https://markofquality.wordpress.com/category/nesso/ ). That project has grown into something much larger than just my headaches. At its core, Project Nesso is about asking better questions. For the last two years I’ve been developing ways to ask questions about a given dataset. This weekend I started a new one. You can now follow me on Twitter @NessoAsks. My goal is to tweet at least one question a day, which forces me to be more mindful of what is going on around me every day. I’m curious to see how my questions improve over time, and if those questions can spur some interesting discussion. December 10, 2018 Posted by markegilbert | Nesso	| Comments Off on Tweet, tweet? I mentioned in my last post that the logic for displaying terms and operations was much more complicated than I originally anticipated. The logic evolved as the game development progressed, and CJ and I identified new and interesting edge cases to be addressed. The switch statement sorts out which operand and which sign will be displayed. The latter is dependent on the former. For adds & subtracts, the operand and the sign end up effectively merged with each other. Adding a positive 4: "+4"
Adding a negative 4: "-4"
Subtracting a positive 4: "-4"
Subtracting a negative 4: "+4"
Multiplying a positive 4: "*4"
Multiplying a negative 4: "*-4"
Dividing by a positive 4: "/4"
Dividing by a negative 4: "/-4"
That’s all there is for rendering operations. Let’s move on to how terms are presented. This concept of "leading term" crops up a couple of times in the other methods we’ve looked at. The signs for the first term on either side of the equal sign get treated a little differently. While other additions show a "+" followed by a space. Parentheses are included (to distinguish the sign, coefficient, and variable more clearly), as is the "first term" logic. At this point, you might be asking why I ended up with three different approaches to formatting the values. The requirements for operations, constant terms, and variable terms have overlap, but none of them were complete subsets of the others. That makes it trickier to factor anything out. I think you can make the argument, though, that showing a constant operation of "-(3/4)", and a constant term of "-3/4" (as the game currently does) is inconsistent and should be normalized. Doing so would go a long way to making it easier to refactor the logic together. Another improvement for a later version. In my last post, I walked through how the player’s operations get applied to the equation. The first step in that was to validate that the operations applied were actually valid. Today, I’m going to go through that validation method: ValidatateOperationsBeingApplied. The method is passed a list of the operations to apply, and a boolean called ShouldForceOperationsToMatchTerms. The general design is that it makes a single pass through the list of operations, calculating statistics as it goes, and then does a series of comparisons to verify everything is in order. In theory, the application should not allow either of these cases to occur, but #BugsHappen. Next, the method calculates a couple of quick statistics on the terms. These will be used as the baseline that the operations will be compared to. The first conditional checks to see if a constant operation is being applied to a variable one. That’s ok when the player is multiplying or dividing by that constant, but not when they’re trying to add or subtract it. The second conditional checks to see if a variable operation is being applied to a constant one, which is never allowed. In both cases, a TermOperationMismatchException is thrown. If the equation is configured to allow mismatches, then the player can try it, but ApplyOperations will simply carry both the original term and the new operation forward into the next equation state. For the current iteration of the game, all of the levels are configured to allow mismatches to occur, so this logic is not actually executed during regular gameplay. Next it looks at what kind of operations (addition, division, etc.) is being applied. Recall from "Applying Operations” that the player is only allowed to apply a single operation to the equation at a time. The if-then-else-if verifies that that is the case. It looks for the "first" operation being applied, and makes sure that all of the other ones match it. Then it increments 2 of 4 counters, depending on what kind of operation is being applied, and whether or not it’s encountered the equal sign already. First, if the list of operations didn’t even include an equal sign, it’s clearly invalid. This verifies that the number of operations on the left matches the number of terms on the left. I only have to verify that the left sides match in number. At this point in the logic, I can safely assume that the right sides also match since a) I’ve already verified that the total number of operations matches the total number of terms, and b) I’ve verified that the former contains an equal sign. Now it verifies that the player applied SOMETHING to the equation – at least one of these statistics (and ideally 2) should be non-0. …and that there was at most 1 operation applied on each side (again, if the left matches the right, I only have to check the count on the left). Finally, if the player didn’t apply an addition/subtraction operation, then they must have applied a multiplication/division operation. 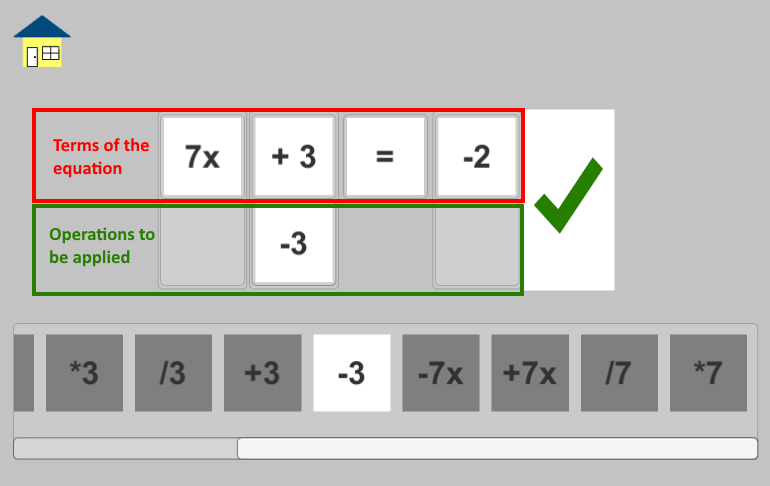 Check that the number of multiplication operations applied on the left matches the ones on the right. Then check that the number of division operations match left and right. If all of these checks pass, then the operations being applied are valid, and the player can proceed. In my next post, I’ll go through the logic involved in displaying an operation in the UI. As it turns out, it’s not as simple as "is the number negative or not?" It was surprising how many scenarios had to be accounted for to get it right. Last time, we walked through how the operations in the tray get generated, based on the current equations. Now we’ll see how those get applied to the equation to solve it. Let’s square away some UI-terminology first. The equation to be solved is arranged in a series of UI "dominos". Each domino has two parts. The upper portion is a "term" of the equation, and the lower portion is the "operation" to be applied to it. The process begins when the player drags his or her first operation off the tray onto a domino. As soon as they select an operation, all of the others in the operations tray are disabled, preventing them from trying to apply two different operations in the same pass. Once the user clicks the "Go" button, the system pulls together the list of operations to be applied. For the dominos that didn’t get an operation, a special "NoOperation" object is used as a placeholder. The first thing ApplyOperations does is call ValidateOperationsBeingApplied, passing it both the list of Terms and the list of Operations to apply. The method does just what you think it would – makes sure the user hasn’t done anything invalid like trying to apply an operation to only one side of the equation. The logic for this is not trivial, so I’ll cover that in my next blog post. If the operations being applied are not valid, an error is returned to the UI, and the player can then correct it. If the operations are valid, then it moves on to actually applying them. The majority of ApplyOperations is a loop that walks through each Term/Operation pair, to evaluate what the "new" equation state should be. With each term-operation pair, the code determines whether to carry forward 0, 1, or 2 terms into the new equation. Those were the easy cases. Now comes the fun ones. What happens if the player tries to apply a constant operation to a variable? In the cases of addition and subtraction, both the term and the operation are carried forward into the NewEquationState, since these really don’t combine. In the cases of multiplication and division, the constant does get applied to the variable, and the resulting variable is included in the NewEquationState. And then, what about the case where the user applies a variable operation to a constant? // both forward to the next equation state. The exception is when the term is 0. That shouldn’t be carried forward. // 0. That shouldn’t be carried forward. In this case, if the constant term is non-0, addition and subtraction work the same as above – these don’t combine, so both the term and the operation are carried forward. Finally, trying to multiply or divide by a variable is not allowed in this version of the game, so those just throw errors. The player doesn’t even have the option to apply a variable operations involving multiplication or division (GenerateOptions method doesn’t currently generate these), but I included the check here for completeness and safety. First, it makes sure there is at least something on both sides of the equals sign. If not, it adds a constant term of 0. Then it runs through the new terms, and flags the first one on each side as officially "first" (needed so the UI can render the signs correctly). Finally, it updates _Terms with the new equation state, and checks to see if it has, in fact, been solved. In my next post, I’ll return to how the operations are validated before being applied. In my last post, I walked through how a new equation gets generated. The game also generates a list of operations that the player could apply to the equation to simplify it. An equation starts out with coefficients and constants that are randomly generated. Then, as the player works through the problem, those values shift. As a result, the game needs to refresh the list of possible operations each time a new equation is generated, the player applies an operation to the equation, and so on. The Equation class has a method called GenerateOperations() that generates a list of IAmAnOperation objects based on the current state of the equation. (IAmAnOperation objects are similar to IAmATerm objects, but they also include the operand to apply – add this, multiply this, etc.). This method is used at the beginning when the equation is first generated and every time the equation is updated as the result of a player’s action. Before I get into how the operations are generated, though, I need to discuss how the coefficients/constants are stored. The initial version of the game stored these values as floats. As the development progressed and I played the game more, I began to realize that that was a poor design decision. “1.0x”? There was code in the game specifically designed to drop the “1” for variables, but what I found in this case was that the coefficient on the variable was not “1”, but “1.0000000001”, or something similarly silly. I started down the road of implementing logic that would treat something “very close to 1” as 1, but hit a lot of problems getting the rounding to work. Then there was the UI itself. If you solve equations like I do, you reduce the equation until there is a single variable term on one side and a single constant term on the other, and then apply a division operation to get rid of the variable’s coefficient. That means you have to divide at most once, which means any fractional values will be remain relatively simple as you work through the equation. However, the game doesn’t prevent you from going off the rails by applying division operations over and over again, which will quickly lead to crazy-fractional numbers. With the floating-point approach, those numbers became much smaller than 1, and required a lot of space on the screen to display, e.g., “0.0012”. I couldn’t increase the size of the UI elements, and I could only shrink the font so far before it became unreadable. Finally, CJ made the argument that keeping the values in fractional form would make it easier to read and simplify the equation. If you’re presented with “0.328”, it may or may not be obvious that multiplying that by 125 will leave you with a simple “41”. However, if you were presented with “(41/125)x”, your next steps become a lot easier to see. This change would also have a direct impact to how I generated potential operations for the player to apply. If the numerator is 0, skip this term and move on. If the term is a variable, and multiplication/division are needed, append two operations to the list – one that adds the current term, and a second that subtracts it. Why append *add/subtract* operations if multiplication/division are needed? Because if the latter are needed, it means the possibility of multiple variable terms in the equation. If those terms happen to be on the same side of the equation, the player can directly combine them. However, if there are variable terms on both sides, then the player will need to add or subtract one to simplify it. If the term is a constant, append two operations to the list – one that adds the current term, and a second that subtracts it. If the numerator is not 1, and multiplication/division are needed, append two operations to the list – one that multiplies by the coefficient, and another that divides by it. Finally, if the denominator is not 1, and multiplication/division are needed, append an operation to the list that multiplies by that denominator. This gives the player a way to clear out the fractional denominators. It’s quite possible that there would be duplicate operations added as a result of all of these rules, so one of GenerateOperations’ final step is to dedup the list. In my next post, I’ll look at the ApplyOperations() method, which does the work of validating that the player has applied a given operation correctly, and if so, does the work of transforming the equation as a result of that operation. 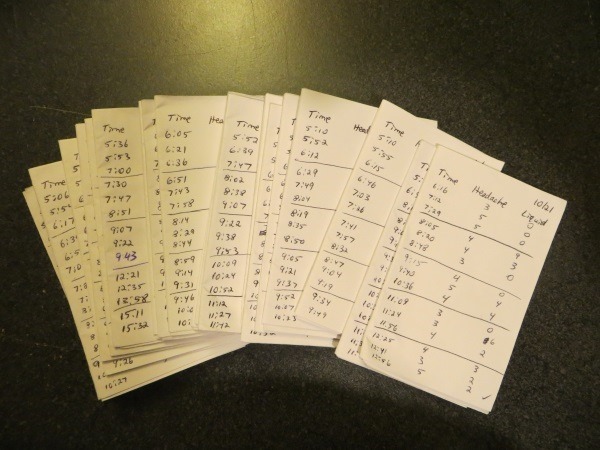 For the first three weeks in October, I conducted an experiment – on myself. I’ve suspected for a while that at least a contributing factor for my daily headaches was not drinking enough throughout the day. There had been days where I got so busy at work that I went the entire workday drinking only 8oz. By the time I got home on those days, my headache was raging. For several days leading up to the start of Week 1, I took no Excedrin. I wanted to get that completely out of my system, so it wouldn’t interfere. I also vowed to not take it during the three weeks, for the same reason (as I’ll discuss towards the end, I broke that rule once). 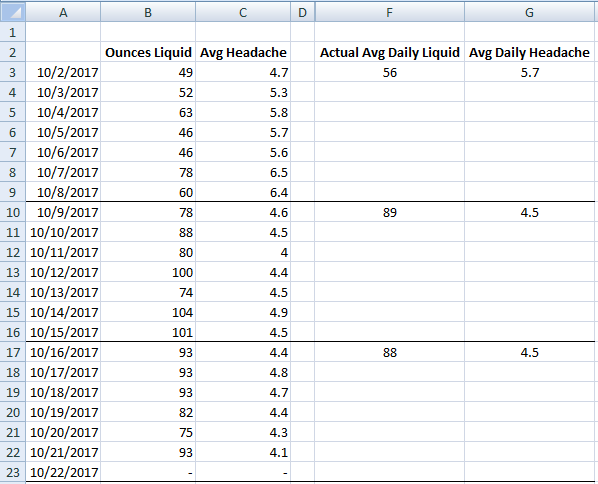 The days I averaged only 56oz, my average daily headache was 5.7. When I increased that amount to 50% more (which worked out to about 84oz of liquid per day), my average daily pain level dropped more than a full point to 4.5. In fact, the effect was so pronounced that I modified Week 3 to merely be a duplicate of Week 2 (mostly to demonstrate Week 2 hadn’t been a fluke). I don’t normally notice myself getting thirsty during the day, but apparently I was – and have been for years. In fact, for the first few days of Week 2, I learned to start drinking immediately after taking a reading, just so I would remember to drink more! Since the end of Week 3, I’ve kept up my regimen of drinking 84+ ounces a day, and my headache has pretty consistently stayed lower. I’m chalking that up as a win. I mentioned at the beginning that I vowed I wouldn’t take Excedrin during this experiment, because I didn’t want it tainting the numbers. At the end of Week 2, I woke up Sunday morning with an extremely nasty headache. The baseline pain was a 6 (out of 10), but then periodically I would get a sharp stabbing pain behind my right ear, pushing my the pain up to an 8 or a 9. I had been doing great all week – what happened? The day before I had consumed over 100oz of liquid, so it’s not like I fell back into old habits on that front. Oh – the chicken. We had take out fried chicken the night before for dinner – something that I know is crazy high in sodium: 2 chicken strips, a regular side of potato wedges and a biscuit come to 2,470mg of sodium – more in one meal than I’m supposed to be getting in the entire day. CJ has reported getting headaches pretty consistently after eating that meal in the past (especially if we had the leftovers the second night). Perhaps sodium – or more correctly, too much sodium – is another trigger? I’ve never tracked how much sodium I consume in a given day. I wonder what would happen if I decreased that? And THAT will become my next experiment. Stay tuned. “Progress” is changing code that results in a new error message. October 25, 2017 Posted by markegilbert | Software Process	| Comments Off on Um, progress? In my previous post, I covered how the complexity of each of the game’s levels are configured. This post will walk through how that configuration gets turned into an actual equation. First, please note the use of “numerator” throughout this logic. The code maintains the coefficients and constants in fractional form, rather than decimal. I’ll discuss this at length in a later blog post. Currently, BuildTerms will only generate whole-number coefficients and constants – that is, numbers with a denominator of “1”. For variables, it checks to see if multiplication/division are needed. If not, the coefficient for the new variable is “1”. If those operations are needed, it generates a number in the range [-MaxAbsCoefficient, MaxAbsCoefficient]. If it generates a “0”, it increments it to force it to be “1” instead (variables with a coefficient of “0” are never allowed). Next, it checks to see if coefficients of “1” are even allowed. If they are not, it will increment any “1” coefficients, making them “2”. Finally, it adds a new Variable object to the list using the generated coefficient and the chosen variable letter (which was selected in the constructor). It generates the new numerator in the range [-MaxAbsConstant, MaxAbsConstant]. Constants of “0” are allowed if there is only 1 constant (and 0 variables) allowed on this side of the equation. If there are supposed to be more than that, the new numerator is incremented to make it non-0. Lastly, it generates a new Constant from the new numerator, and adds it to the list. After all of the terms have been generated, the logic marks the first term in the list explicitly as “first”, allowing the UI to render the number correctly (something else that I will cover in a later post). You’ll see by the TODO that I originally wanted to have the method shuffle the terms randomly, so that variables are not always listed before constants. However, I encountered problems getting the randomized list to actually display in the UI randomized. I fought with it for a bit, and then just moved on. Another issue for the future. You may also notice that I’m using a mix of values passed in as parameters to the method, and also accessing a private member of the class directly. I need to pass in “NumVars” and “NumConsts” explicitly because I’m calling this method twice – once for the left side of the equation and once for the right. The other values apply equally to both sides of the equation (no pun intended), so I had a choice of how to make them available to the method. The hybrid approach is something else on my list of things to clean up. In my next post, I’ll cover generating the operations that the player can apply to the equation. Combining the “3” and the “4” into 7 would be enough to solve this equation. The second and subsequent levels would teach the player additional techniques that he or she may need to solve more complicated equations, and then, of course, generate a series of problems that required that technique. An EquationConfig object gets passed into the “Equation” class (which does the work of actually generating the new equation, based on the configuration passed in; I’ll go through this class in depth in my next post). Each equation will consist of some number of variables and constants on the left side of the equal side, and some number of each on the right side. Each variable will have a randomly generated coefficient in the range [-MaxAbsCoefficient, MaxAbsCoefficient], except for 0. Each constant will have a randomly generated value in the range [-MaxAbsConstant, MaxAbsConstant]. Constants of 0 are sometimes allowed (as we’ll see in the next post). AreMultiplicationAndDivisionNeeded: If this is true, then non-1 variable coefficients are allowed and operations involving multiplication and division are included in the tray; otherwise they aren’t. These are needed to generate the lower levels where we want players to focus on learning to use addition and subtraction operations to solve equations. Multiplication and division will come later. VariableLetterPool: A string that determines what will be allowed for the variable – just “x”, most letters of the alphabet, or most letters of the alphabet except for “x”. I say “most” letters of the alphabet because we initially left out the letters “o” and “i” – those looked too much like the numbers “0” and “1”. Once we started playing, though, we quickly realized that the letters “e” and “i” should be left out as well, since those have special meaning in math (Euler’s number, and the square root of -1, respectively). This is needed with the level that involves solving equations that have something other than “x” for the variable. AreVariableCoefficientsOf1Allowed: If this is false, then all variables are required to have a non-1 coefficient. This is used on the level that requires the player to use multiplication and division to simplify the variable. Having something like “x = 2” right out of the gate would defeat that purpose. Without a “divide by 2” operation, the player couldn’t solve this. make sure there is at most 1 variable on the left. make sure there is at most 1 variable on the right. make sure there is only 1 variable in the entire equation (don’t allow variables on both sides of the equal sign). In most ways, the last check covers the first two. However, having all three allows me to record a more specific error. Next, we need to pick a letter to use as the variable in the new equation. Which does have a solution. In retrospect, this validation logic probably makes more sense as a method on EquationConfig (VerifyThyself, or something like it) than in the Equation constructor – a refactoring for the future. Level 1: Combining constants on the same side of the equal sign. Shows the user that they can drag constants to combine them. Requires a single variable with a coefficient of 1 on one side, and two constants on the other. Level 2: Moving all of the constants to one side of the equal sign. Introduces addition and subtraction operations, and teaches the player to apply those operations to both sides equally. Requires a single variable with a coefficient of 1 on one side, and constants on both sides. Level 3: Reducing the variable’s coefficient to 1. Introduces multiplication and division operations, and teaches the player to apply those operations to every term on both sides. Requires a variable on one side with a coefficient of something other than 1, and a constant on the other side. Level 4: Reducing the number of constants, and reducing the variable’s coefficient. Combines the previous lessons, and teaches the player that they sometimes need to perform multiple steps to solve the equation. Level 5: Solving for variables other than “x”. Similar to Level 4, except that now the variable in use is something other than “x”. These level-configs are currently stored in a JSON file that gets loaded with the game, but the groundwork is laid for future versions to call a web service to pull them down. In my next post, I’ll go through the logic that uses the configuration to actually generate an equation, including the edge cases it handles.